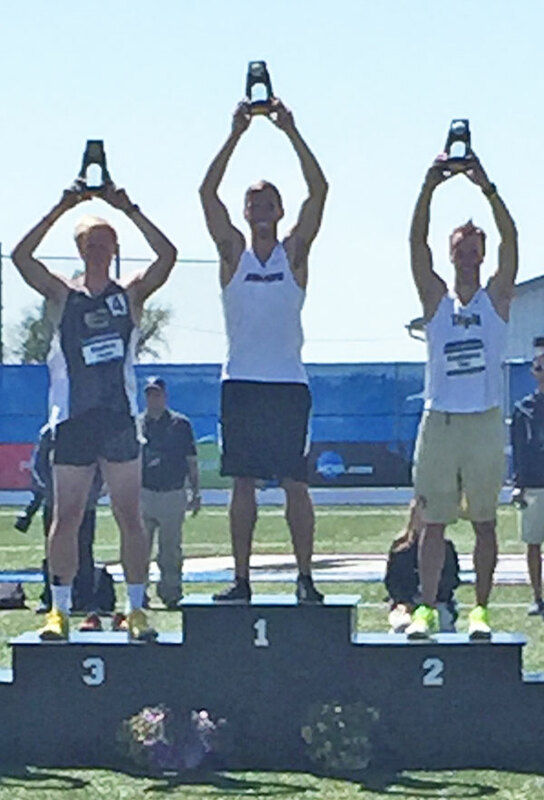 Justin Balczak captured the 2015 NCAA Division II decathlon national championship, picking up his second individual national title. Photo by Joe Reinsch, Asuza Pacific University. Justin Balczak (center) on winner’s stand. Photo courtesy Jeff Myers. Grand Valley State University hosted the NCAA Division II Track and Field Championships on May 21-23. 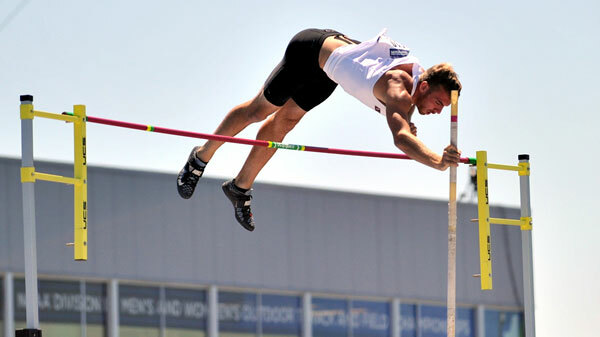 Former state champion hurdler, Justin Balczak (class of 2011), who attends Azusa Pacific University in California, competed in the decathlon, a grueling two-day event. The event accumulates points based on how close the decathletes come to the world record mark in each event. Upon the conclusion of each event, the athletes are given 30 minutes to prepare for their next. There is very little mental and physical rest. On day one, Justin competed in the 100m dash, long jump, shot put, high jump and 400m dash. Balczak posted an 11.37 in the 100; long jumped 23’ 2”; threw the 16lb. shot put 42’ 8”; won the high jump event at 6’ 7.5”; and ran the 400 in 50.36 seconds. After the first day of competition, Justin led the field of 15. Day two started with the 110m hurdles, followed by the discus, pole vault, javelin, and concluded with the 1500m run. His 14.71 seconds in the hurdles placed him second; he struggled in the discus by throwing 116’ 3”; placed second in the pole vault with a jump of 14’ 11”; threw the javelin 175’ 10”; and finished the 1500 in 4:43.99. His points earned declared him national champion in Division II. He is coached by former Olympic decathlete, Brian Clay. In July, Justin will compete in the Pan-American Games in Toronto. With success, he can earn a roster spot on the U.S. National team. Balczak is a well decorated collegiate athlete. He has earned All-American status four consecutive years competing in indoor track and field (three at Lake Superior State University and one at Azusa Pacific), while being awarded All-American three times in the outdoor season (two at LSSU and his first at A.P.U.). He has one season of eligibility remaining in outdoor track and field.